Inspired by Arthur Schnitzler's classic La Ronde, screenwriter Peter Morgan (The Last King of Scotland, The Queen, Frost/Nixon) and director Fernando Meirelles' (City of God, The Constant Gardener) 360 combines a modern and dynamic roundelay of stories into one, linking characters from different cities and countries in a vivid, suspenseful and deeply moving tale of love in the 21st century. Starting in Vienna, the film weaves through Paris, London, Bratislava, Rio, Denver and Phoenix into a single, mesmerizing narrative. 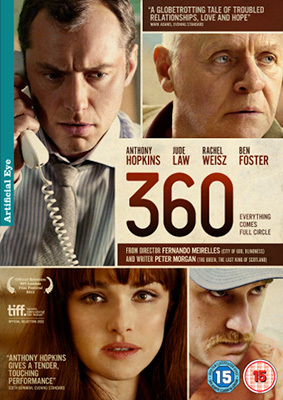 360 stars Anthony Hopkins, Jude Law and Rachel Weisz, and was first shown in the UK at the 2011 London Film Festival, where it was the opening gala film. Our own Timothy E. RAW was there for that screening and was less than enamoured with the film itself. You can read his review here. The film has certainly not found the same level of critical acclaim as his auspicious breakthrough film City of God, but if you're looking to catch it anyway (and for all its flaws, it's definitely worth a look) and you missed it on its cinema run then you won't have too long to wait for the UK DVD and Blu-ray release, which is set for 14th January 2013, courtesy of Artificial Eye at the RRP of £15.99 for the DVD and £19.99 for the Blu-ray.